The video has since been removed from You Tube. 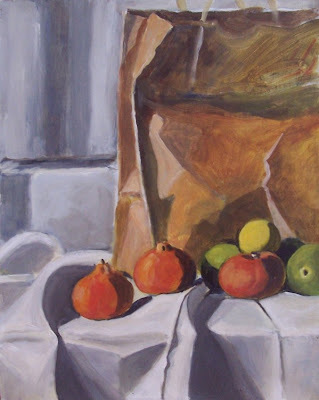 Last Saturday the Plein-Air Picassos held a Still Life Studio at the Art Society headquarters. I was asked to "lead" it, which meant helping to set up the arrangement and being available if anyone asked for help, but it was definitely not a workshop or a teaching session. It went well enough and was a good experience. An early difficulty was evolving the arrangement, which I tend to do during the preliminary drawing stage. This wasn't very practical with several people working on the same arrangement at once. People didn't appreciate having objects added and removed after they were well into their drawings. Mine evolved from horizontal to half-horizontal to vertical. At first I wasn't displeased with the end result, and I let Peter take a shot of it. After bringing it home I didn't feel as good about it as before. Everything was a little too small. So, since I had taken the objects with me, and had brought them home again, I set up an arrangement in my studio with the same objects and did it over. The second one came out very different from the first and I'm not sure what to make of it. This is it, acrylic on canvas, approx. 18 x 14". Another drawing from that day at Bonanza with the Plein Air Picassos. It shows one of the foals lying down for a rest. 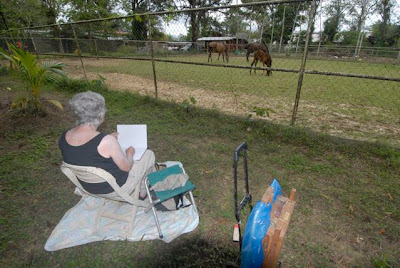 I didn't produce much during the April 6th trip to Bonanza Farm, organized by the Plein-Air Picassos, a sub-group of members of the Trinidad and Tobago Art Society. But it was a good day all the same. I remembered to put on sun block, for one. The place was beautiful with loads of space for the group to spread out, a working horse farm with paddocks and wide open spaces, bounded by the Caroni River and fringed by bamboo. In one small paddock there were two mares with foals. I spent maybe two hours drawing there, fascinated especially by the foals. They have a sort of confidence, an insouciance, a certainty of their right to be in the world as independent, individual beings. But they don't stray far from their mothers either. 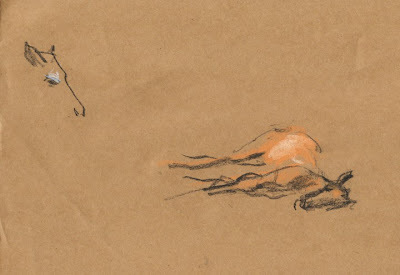 One of them took off all of a sudden and galloped round and round and round the perimeter of the paddock, its delicate long legs at full stretch. It made five or six rounds, maybe more. Was it just an expression of the joy of life and youth and energy? Or was it frustration at being fenced in? And then just as suddenly it swerved towards the centre and came to an abrupt stop beside the mother. The drawing below is the best of a bad lot. I was striving for the relationship between mare and foal but didn't get enough in before they inevitably moved off somewhere else. 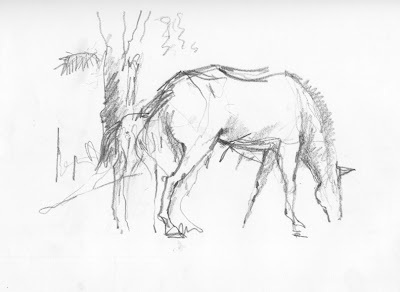 But even so, if you look really hard, you can just about see the hindquarters of the foal and its tail and hind legs to the left of the grazing mare. Drawing horses at Bonanza, photo courtesy Peter Sheppard. Read Peter Sheppard's account of the day.